In large skillet, cook ground beef over medium-high heat, stirring frequently, until thoroughly cooked; drain and return to skillet. Stir in uncooked rice and seasoning mix, water, vinegar, cinnamon and salsa. Heat to boiling. Reduce heat to medium-low; cover and simmer 10 to 12 minutes, stirring occasionally, until rice is tender. Stir raisins, almonds and olives into beef mixture. Spoon about 3/4 cup mixture down centre of each warm tortilla; roll up. 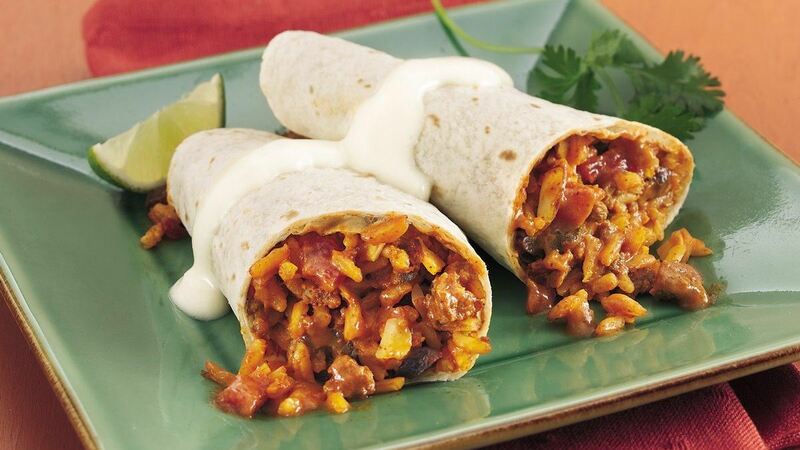 Serve wraps drizzled with topping; garnish plates with lime wedges and cilantro sprigs.